A drama portraying a family tearing itself at the seams, Ordinary People slowly burrows its way through a post-tragedy crisis that is more than ordinary people can handle. The film shines thanks to a patient script that gives up its secrets at a deliciously slow pace, and a collection of terrific performances. Conrad Jarrett (Timothy Hutton) is a withdrawn teenager from an upper middle-class family in suburban Chicago, active in choir and swimming but dealing with a failed suicide attempt and suffering through a dysfunctional relationship with his cold-hearted, emotionless mother Beth (Mary Tyler Moore). Conrad's brother Buck, a more outgoing, vivacious personality, died in a boating accident, and Conrad could not do enough to save him. Conrad blames himself for Buck's death; Beth does not help matters by also blaming Conrad for Buck's death. Conrad's dad Calvin (Donald Sutherland) is caught trying to nurture his suicidal son back to mental health and dealing with his wife's emotional paralysis. 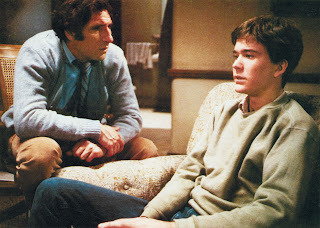 Conrad's fortunes start to improve thanks to therapy sessions with Dr. Berger (Judd Hirsch), who connects Conrad with the causes of his distressed emotions and encourages him to express himself. A burgeoning relationship with fellow choir singer Jeannine (Elizabeth McGovern) also helps Conrad to come out of his shell. With her son confronting the past more positively, Beth has nowhere to hide and is forced to face her own attitudes towards her family. Ordinary People gains its impact from an emotional mystery structure, the equivalent of arriving at an accident scene and finding the survivors walking around in shock. What happened and why it happened is slowly revealed over the course of the compelling film. Robert Redford displays remarkable maturity for a debut directorial effort, sprinkling clever little touches and interesting angles throughout the film without drawing unnecessary attention to himself. He provides the canvass for his four stars to shine, which they do thanks to an understated script by Alvin Sargent and Nancy Dowd. Timothy Hutton makes a stunning start to his screen career as Conrad Jarrett, hollow eyes not trying to hide internal anguish as he struggles through the minefield of emotions within and surrounding him. Unfortunately for Hutton, this was a case of an acting career starting at the very top, complete with an Academy Award, and heading rather rapidly downhill, as he never found the suitable roles to build a lasting movie legacy. In a brilliant stroke of casting, TV comedienne Mary Tyler Moore reveals herself to be a frighteningly effective dramatic actress as Beth, a woman who has wrapped her heart in several sheets of ice as she goes through the motions of being a mother and wife while internally seething about the unfairness of the loss that has befallen her. And Moore's flawless performance leaves no room for doubt that with Beth, the unfairness is all about her personal loss, and not the trauma that has befallen her family. Sutherland and Hirsch have more straightforward yet still interesting, nuanced, and complex roles, Sutherland as the dad trying to save the functionality of his family, and Hirsch as the empathetic Dr. Berger, helping Conrad to navigate the dungeons of his mind. There is a fifth, less prominent but still impressive role in Ordinary People, Elizabeth McGovern making her debut as Jeannine, and shining as a catalyst for positive change while avoiding most of the attractive girlfriend cliches. Ordinary People won the Academy Award for Best Picture, but has the misfortune of being perceived as the undeserving winner from the year that Raging Bull was robbed. In truth, Ordinary People is an extraordinary film, and 1980 was a relatively rare year in which two films deserved the label of best film.